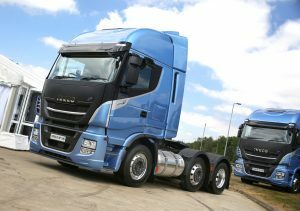 The Iveco dealer has taken delivery of a Stralis NP (Natural Power) LNG 460BHP 6×2 tractor unit, which was launched earlier this year in the UK and has only recently gone into production. Customers who are thinking about switching from diesel trucks to a more sustainable and cost-effective method of operation can test the vehicle in their own environment to prove the cost savings. Robert Spittle, MD of Guest Truck and Van, said anyone within its network of dealerships, which stretches as far as Sheffield in the north to Cambridge in the south and across to Thetford in the west, can book a test drive. He said: “Being the first dealership in the country to take delivery of Stralis NP is a tremendous coup for us. Where operators of 4×2 tractors have been testing gas trucks previously, Iveco has now introduced a real contender to change the landscape of 6×2 fleets. The truck has a range of up to 750km and is available with the latest-generation Hi-Tronix automated transmission, improving performance and productivity. It features the best on-road fuel efficiency technologies and services to deliver up to 15% less fuel consumption and up to 9% lower total cost of ownership than a diesel truck. Compared with Euro 6 limits, it delivers up to a 99% reduction in particulate matter and up to a 60% drop in NOx. It’s also quiet, operating at less than 71dB in ‘Silent Mode’.